The length and path of every flight is different, because we drift with the wind, but we aim for about an hour of flight time for each ride. The whole experience is about three hours from start to finish. That accounts for about an hour of set up/prep time, an hour or so in the air, and then packing up, having our post flight celebration and driving everyone back to the starting point. How many people can fit in a basket? Balloons are like cars, and come in all different shapes and sizes. 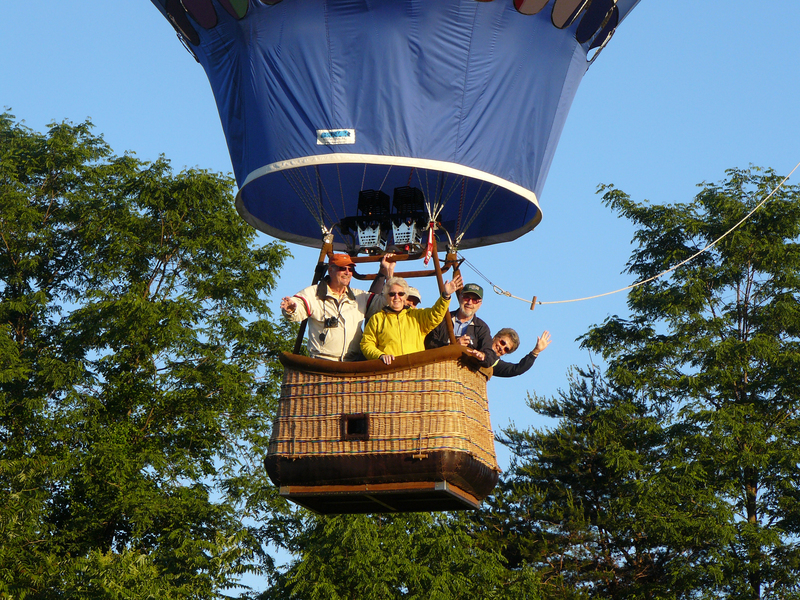 The balloons we fly are the “family sedan” models, able to accommodate 4-5 adults plus the pilot. Currently we operate two balloons, so the total number of people we can accommodate on any given flight is nine. The capacity of any hot air balloon depends on several factors including ambient temperature, relative humidity, and number of people on a flight. The hotter and more humid it is, the less weight a balloon can carry, so the answer to this question is different at different times of the year. Generally, if the combined weight for a group of two is over 425 pounds or an individual’s weight is over 250 pounds, we will need to talk before confirming your reservation. Do we get to fly over the mountains? What will the scenery be like? While we fly in the foothills of the Blue Ridge Mountains and they serve as a backdrop for almost every flight we offer, we don’t actually fly over the mountains. They are beautiful to view from the air, but since they are covered in woods suitable mountain landing sites are few and far between. Our flights generally take place in the Charlottesville valley just east of the Blue Ridge, where we see beautiful rural countryside, suburban communities, rivers, creeks and all sorts of interesting terrain! Balloons are not “steerable” in the conventional sense of the word, but the pilot has some control over the direction of travel based on the different wind layers at different altitudes. Reading the winds and using them to control the direction of our flight as much as those winds allow is one of the fun and challenging parts of flying a balloon! Where do we meet for our flight? Where do you launch and land? We use a variety of launch sites in and around Charlottesville, but our most common meeting places are within 5 minutes of downtown. Since the area is relatively wooded and nestled in the foothills of the mountains, our launch site for any given flight depends on that day’s wind speed and direction. We’re careful to use whichever launch site lines us up for the most favorable landing opportunities downwind! How far in advance should we book our flight? We take bookings for the current calendar year, so you can book as far in advance as you like! On the other hand, we take last minute bookings as well, and will do our best to accommodate everyone. Usually if you book a few weeks ahead of the time you’d like to fly, you’ll have plenty of options. (The notable exception is during peak foliage season; October weekends usually fill up well in advance, so plan ahead!) Feel free to jump on over to our online calendar to check our availability. I’m afraid of heights. Will I be able to enjoy a balloon ride? While we never try to talk anyone into joining us for a flight, if you think you’ll enjoy it, you will! For many people, the difficulty is actually a fear of edges rather than a fear of heights… think rooftops, tall buildings, ladders, etc. When you have a physical point of contact with the ground, your brain is more likely to make the connection and register a degree of fear. In flight, however, there is a mental and physical disconnect that allows your mind and body to experience a new sensation without much fear. Five minutes into the flight, you’ll be wondering why you were ever afraid! Also, unlike in a fixed wing aircraft, there is very little sensation of movement either horizontally or vertically. If you closed your eyes, you’d never know you were flying. Hot air balloons have the capacity to go as high as 15,000 to 18,000 feet (as long as the occupants have oxygen), but our usual flight ranges from treetop height to about 2,000 feet above the ground. Ballooning is an extremely weather sensitive activity, so we keep a very close eye on both the aviation forecast and the current conditions leading up to flight time. If there is anything unfavorable in the forecast and/or conditions, we will call off the flight. The definition of “unfavorable” for ballooning includes: any precipitation in the area, low visibility, thunderstorms within 50-100 miles of our location, surface winds above 8-10 mph, or upper winds above 20-24 mph. We do our very best to accommodate all of our passengers, so if we are able to find another flight time that suits everyone, we are happy to reschedule. But we absolutely will not compromise the safety of our passengers, crew, or equipment in the event of marginal weather! What are the age requirements to ride in a hot air balloon? We recommend that children less than seven years of age should NOT be pushed into flying in a balloon. Many youngsters are frightened of the noise of the burner. Others will be bored by the experience. Also, since our insurance limits the number of persons carried (not the number of pounds), our price is the same for little ones as for big ones. The little ones will grow up too soon anyway…let them wait for their balloon ride until they will really enjoy it. We will still be here. Modern hot air balloons use propane (LP). In the early days (1780’s) of ballooning, the method of heating the balloon was much more …ahem… primitive, but we’ll be sure to fill you in on those fun details after your flight!